When you’re ready to trade in for a family car, Mercedes-Benz may not be the first make to cross your mind; it should be. Visit a Mercedes-Benz dealer in San Antonio, TX, and you’ll be wowed by the number of family-focused, luxury vehicles on the lot. You want legroom for bigger kids, and easy click-installation for car seats. Travelling with kids means toting all their stuff, and these days kids of all ages need sports gear, dance class bags, and overflowing diaper bags. Your next car will need plenty of storage space. For long road trips, you’ll want all the latest technology features including, built-in media devices Wi-Fi, and driver assistance. But, the most paramount item on your list is safety. You’ll need to see the car has been rated at the top-tier for safety ratings. 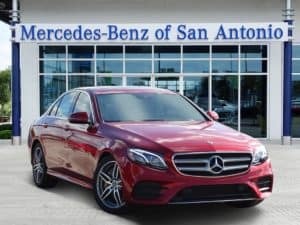 Buy a Mercedes-Benz in San Antonio, TX, and you’ll get all this, plus luxury. U.S. News and World Report named four models available at your Mercedes-Benz dealership in San Antonio, TX, top cars for families. You’ll be one of the first to drive alongside innovative new technology safety features. Your car will see around corners before you do. It can warn you about upcoming road conditions and hazards, and then talk to other cars, warning their drivers too. In the event a collision is unavoidable, your car takes measures to protect you. It emits “pink noise” to protect your delicate eardrums from the massive sound created during a crash. Your seat rapidly inflates to create more cushion and distance from any impending impact. Your cruise control just got smarter. With the touch of a button, your car can independently change lanes, navigate stop-and-go traffic, and even stay between the lines on curves. Mercedes-Benz offers high-quality SUV models perfect for your growing family. This sleek, mid-size SUV offers wide door access, stow-away storage space, and a 40/20/40 split in the rear seats. Equip with all-wheel drive tires, you and your family can travel in style, anywhere. 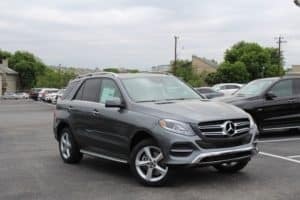 This full-size SUV combines all Mercedes-Benz’ top features for safety, technology, and comfort, not to mention the fashionable appeal of this car, into one sleek model. Match the size of your family to the right certified used Mercedes-Benz in San Antonio, TX, and drive away feeling safe and luxurious.